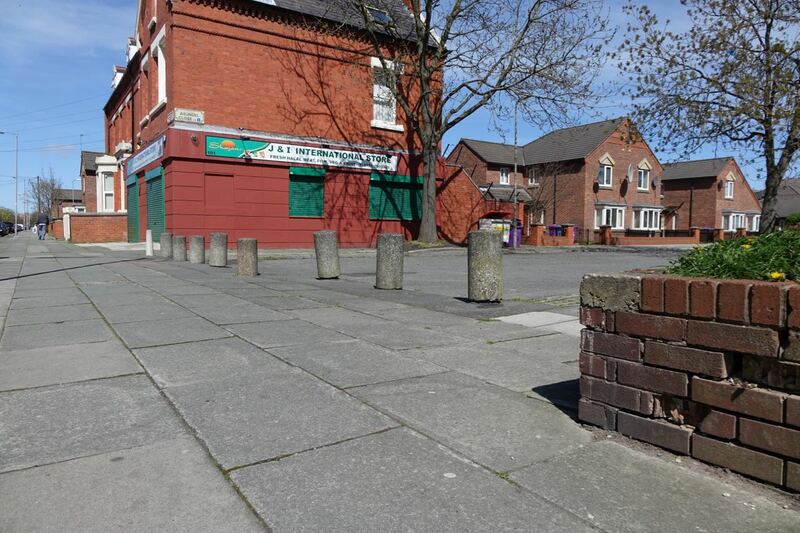 Posted byRonnie Hughes	 April 26, 2015 April 26, 2015 7 Comments on Now With Added Bollards! 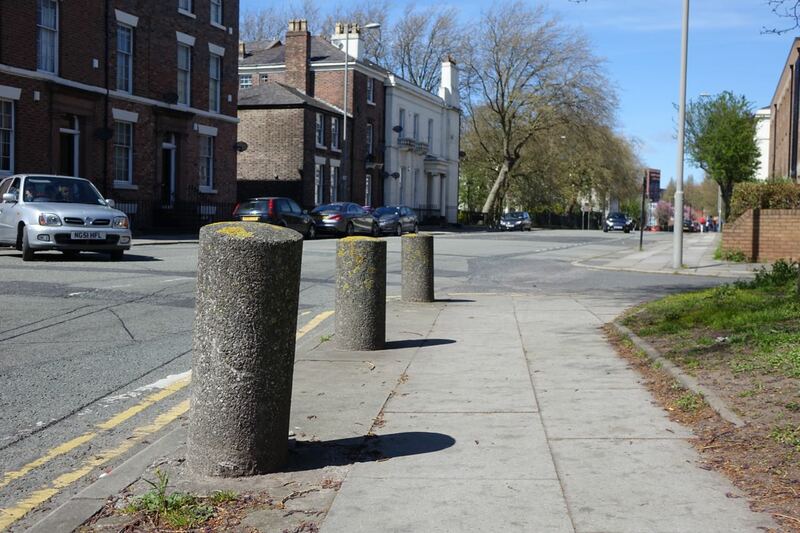 The day dawns sunny, unlike the deluges of yesterday’s post and it’s nearly time to set out on Part Two of our weather interrupted tour of Liverpool 8’s bollards. 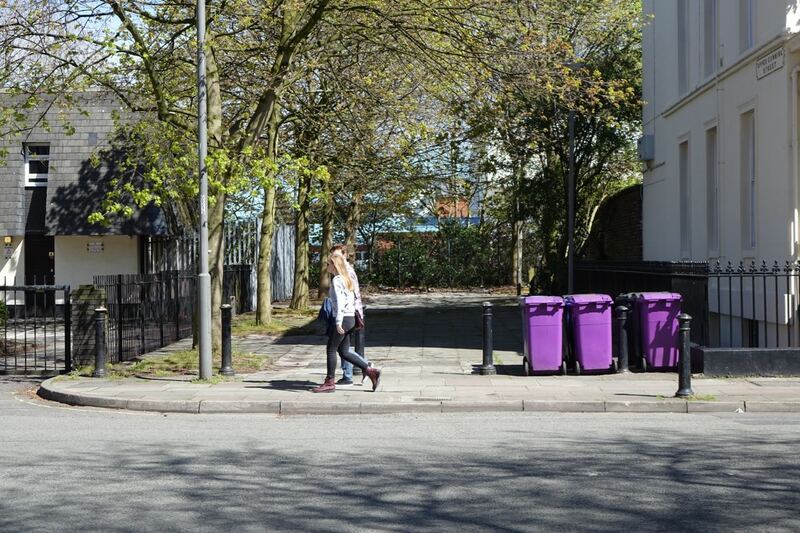 This one walking through Lodge Lane to Granby and Canning. Before we do, a couple of clarifications in response to discussions over the past day or so on Twitter. 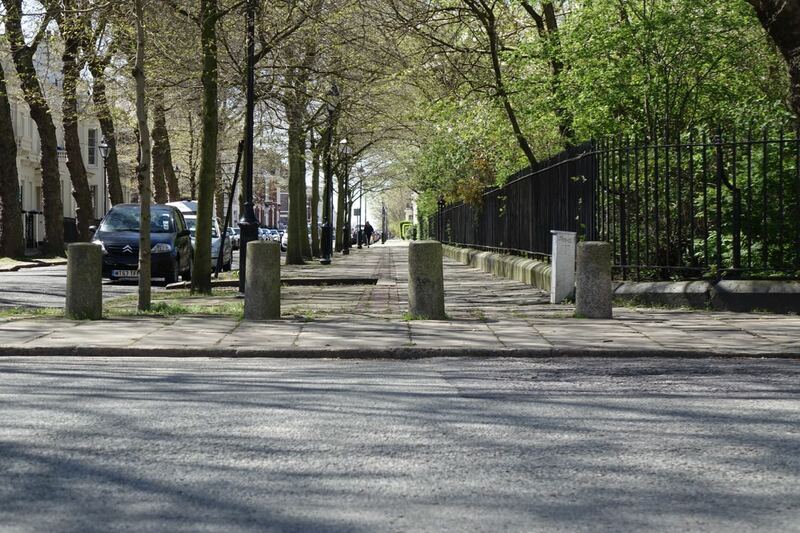 Firstly I don’t for a minute think that ridding Liverpool 8 of its bollards is the most important issue facing society or even Liverpool 8 today. Of course it isn’t. 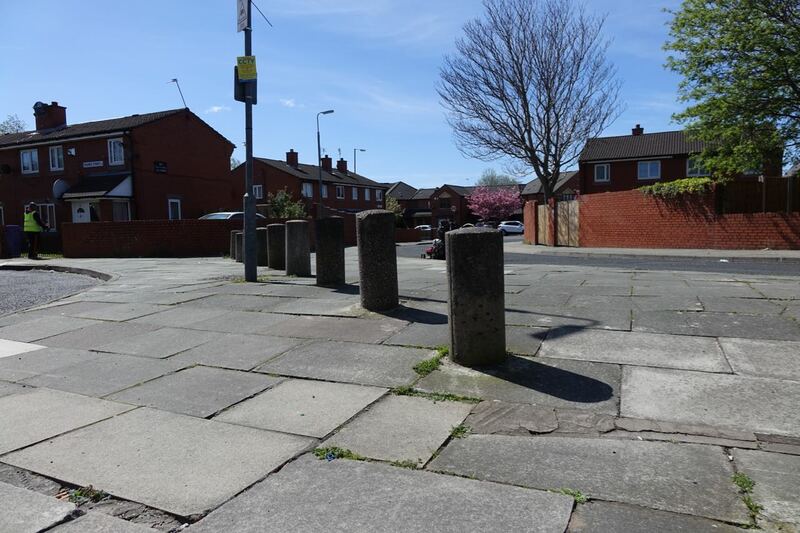 But I am pointing out that there are rather a lot of these bollards, most of them have been here a long time, and I think we should consider getting rid of most of them as they are producing arid and blocked off neighbourhoods. Blocked off for reasons of authoritarian convenience, bordering on social control as I pointed out yesterday. 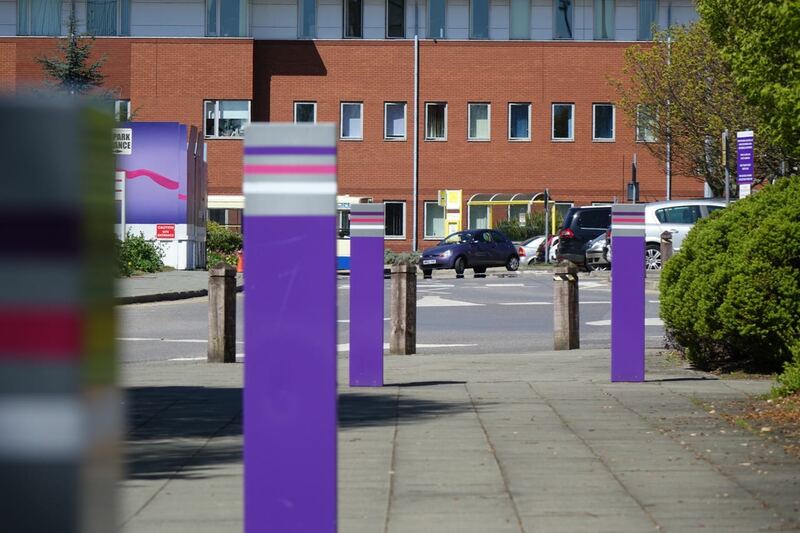 Secondly, I certainly do not want to turn the bollards into any kind of art project or even any kind of campaign. 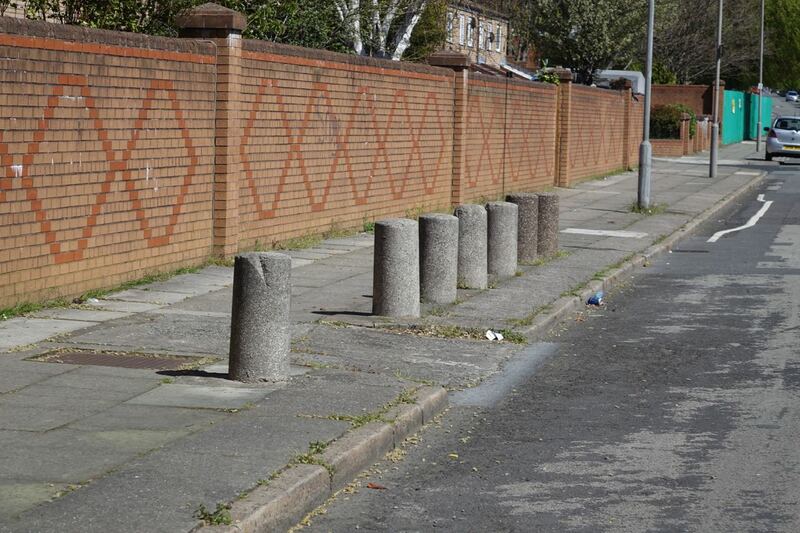 After what I’m about to write I will have had my full say on Liverpool 8’s bollards, and I’ll move on to other things. So let’s get going. 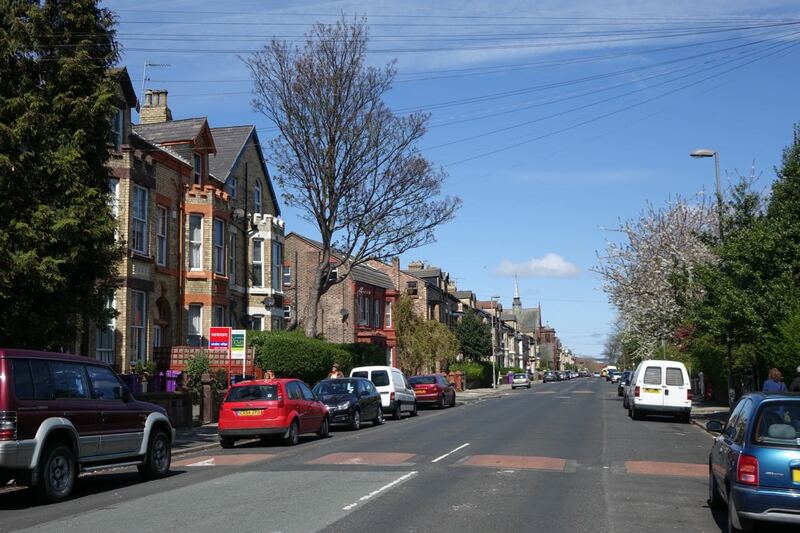 Today’s walk begins on Hartington Road, another of Liverpool 8’s borders. 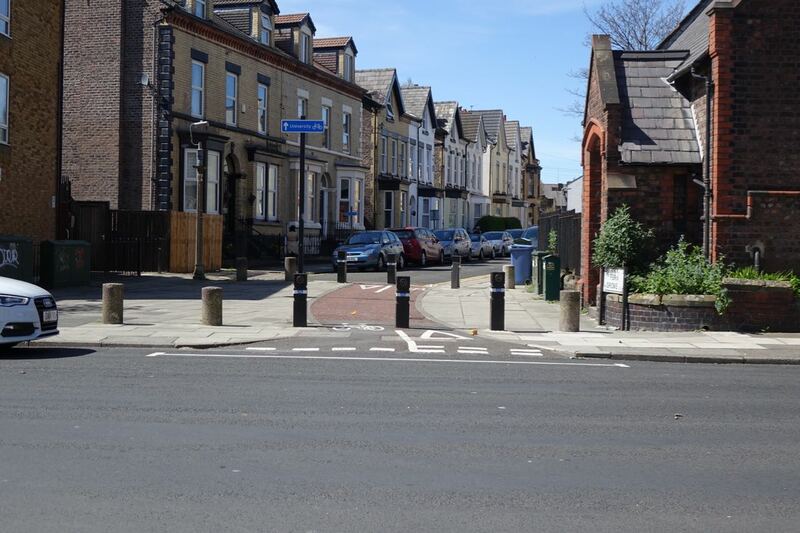 Now you may remember from yesterday’s post, which was mainly around the Dingle and the Welsh Streets, the beginnings of a theory that there are bollards around the borders of Liverpool 8. But can this be true here too? 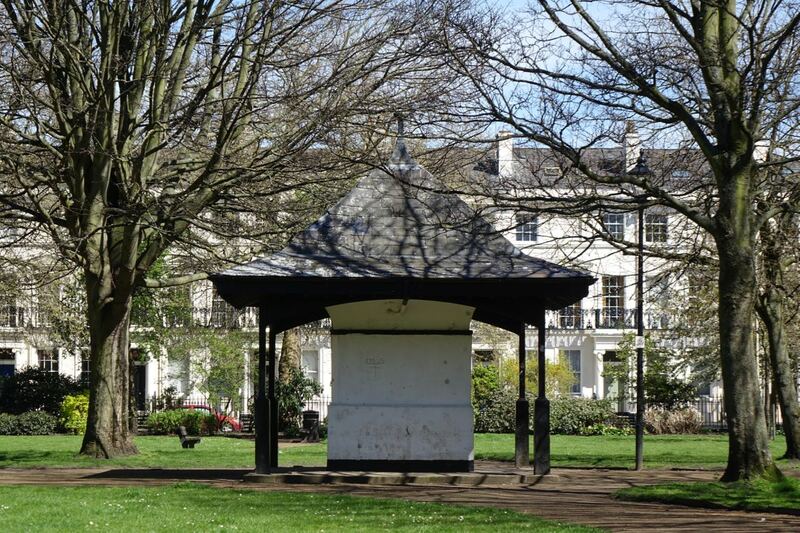 Looking right, away from Liverpool 8 along leafy Arundel Avenue? 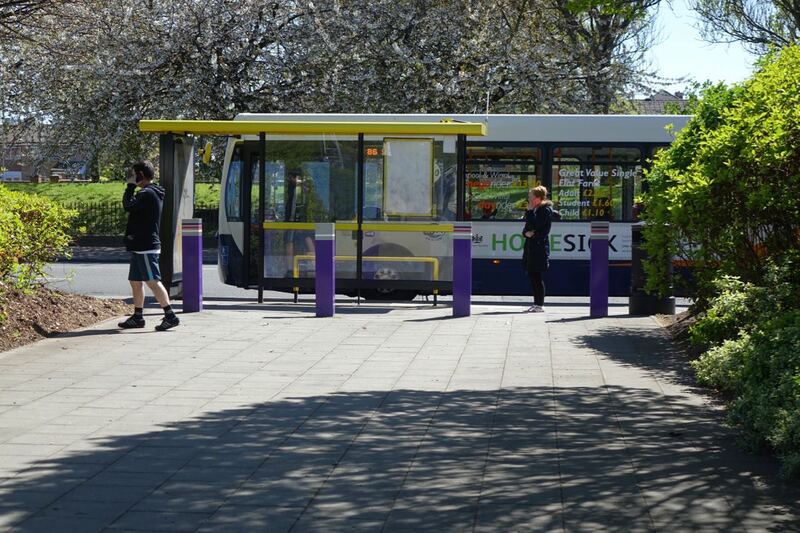 No bollards. 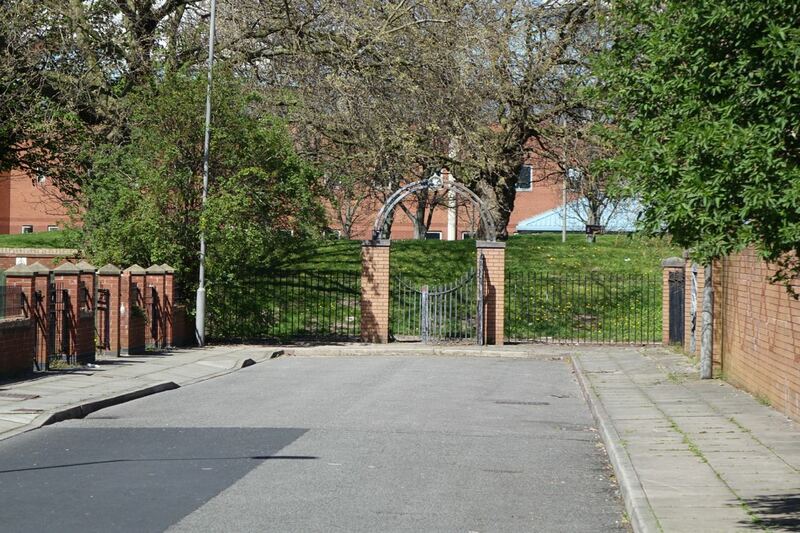 But turning left on Hartington and looking across at the entrance to Fern Grove, Liverpool 8? 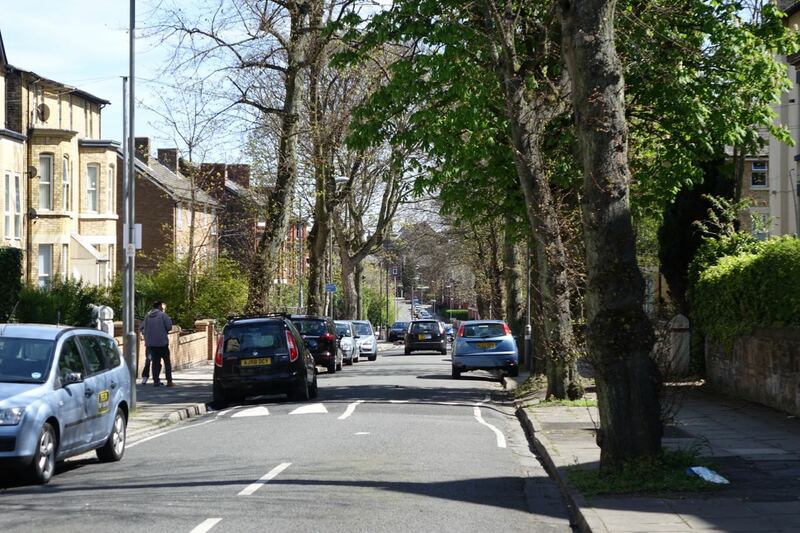 So do the good citizens of the leafy avenues need protecting from the wild savages of Fern Grove and the other streets leading on to Lodge Lane? Don’t think so. Looks pleasant and leafy here too. Then down at the end of the road? More high culture. 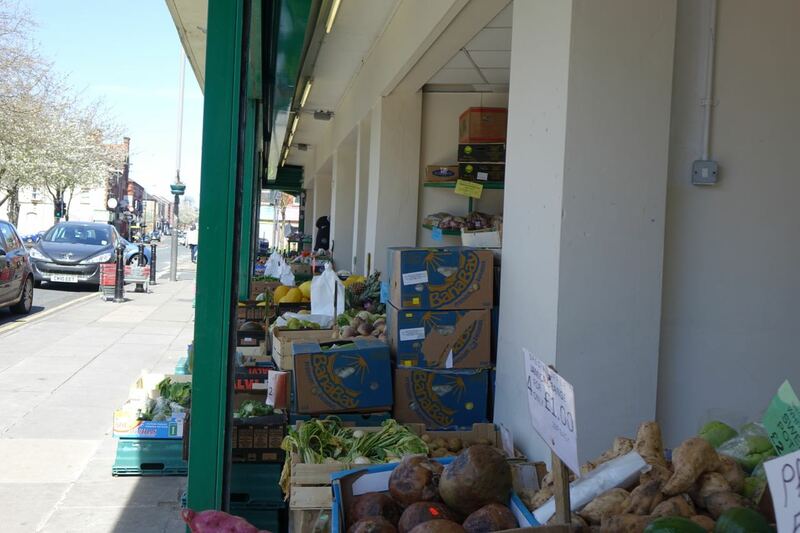 The very great L8 Superstore. 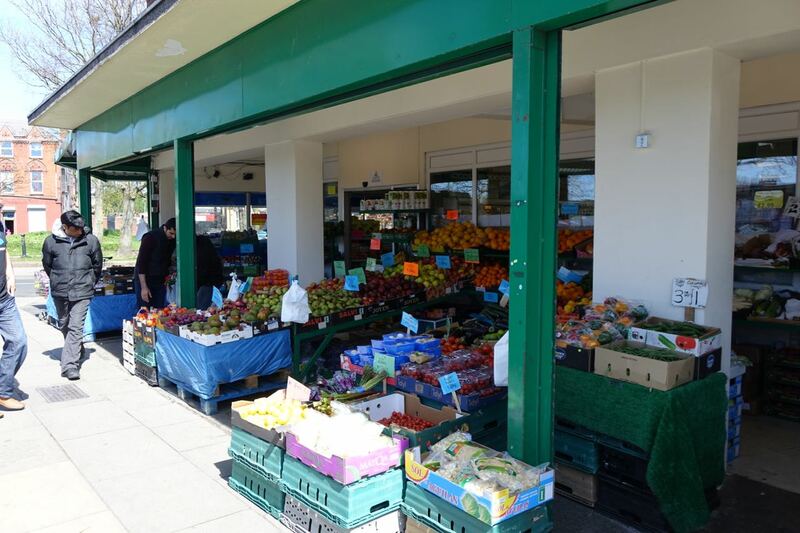 Shortlisted by the BBC as Food Retailer of the Year. Judgement and we hope award coming this week, April 30th. 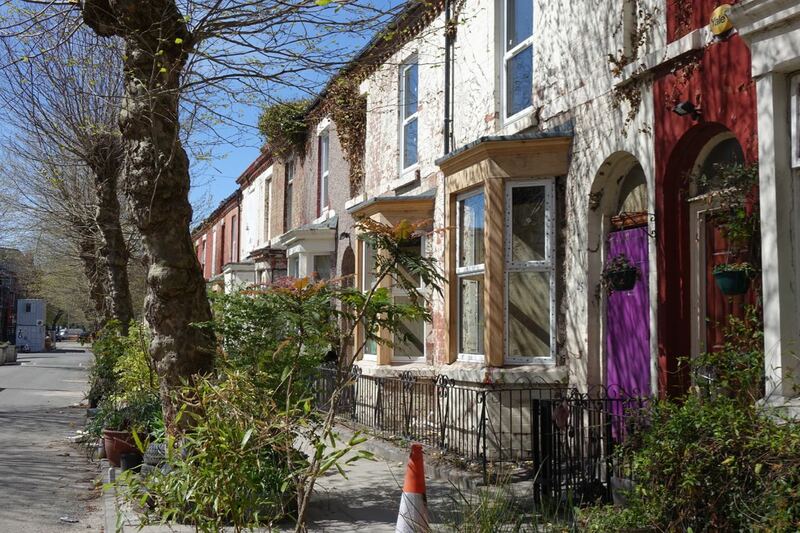 Along pleasant, terraced Ritson Street, on our way to Granby. 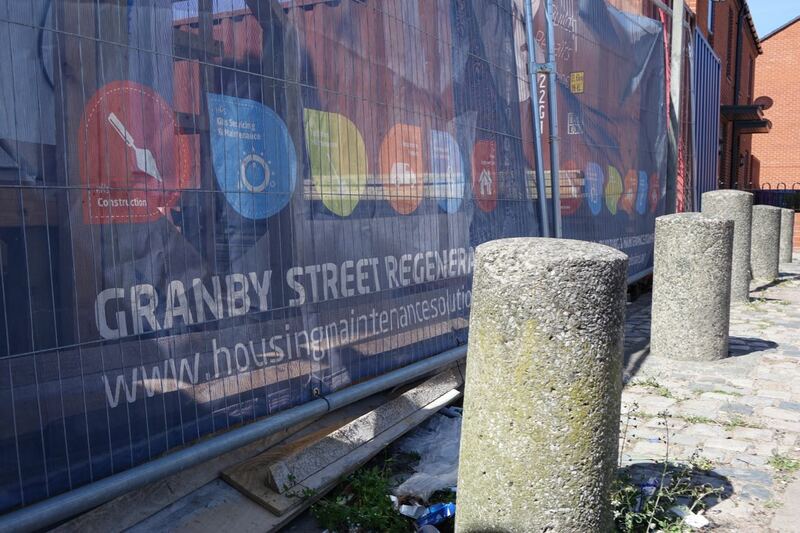 Across at Granby 4 Streets we find bollards protecting the site signage. 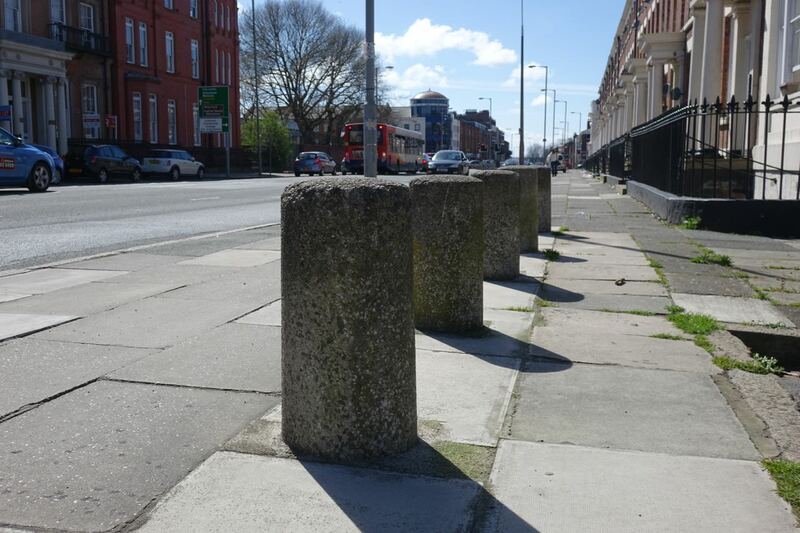 Actually these venerable restrictors are amongst the area’s very oldest bollards. 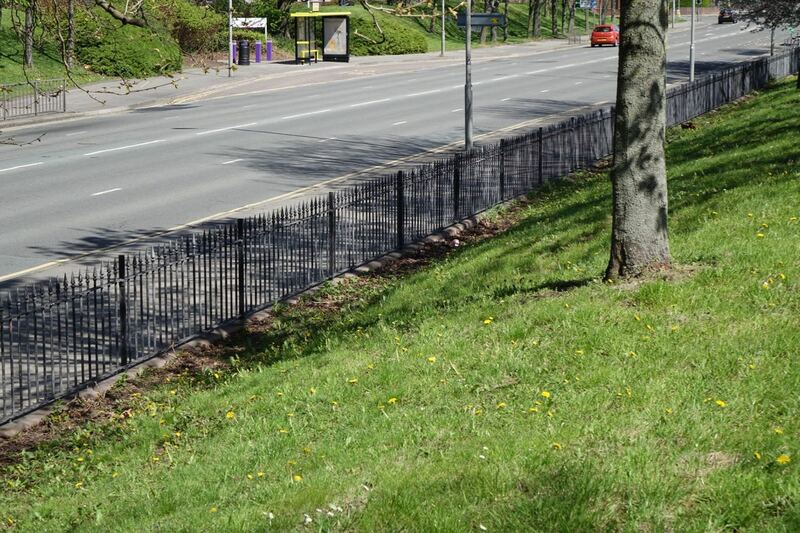 Installed, you may remember from yesterday’s post, to stop kerb-crawling in the early 1970s. 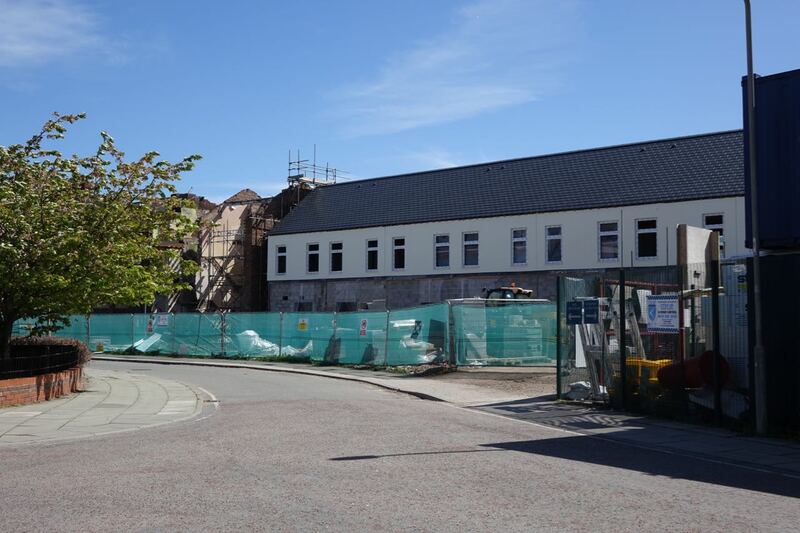 In Cairns Street the Community Land Trust houses are looking well. Then just as I’m taking a better picture of this uber-police bollard than yesterday’s rain would let me, I hear someone calling my name! It’s Yvonne Dalrymple who’s visiting from Nuneaton, with her mother Daphne Millen. 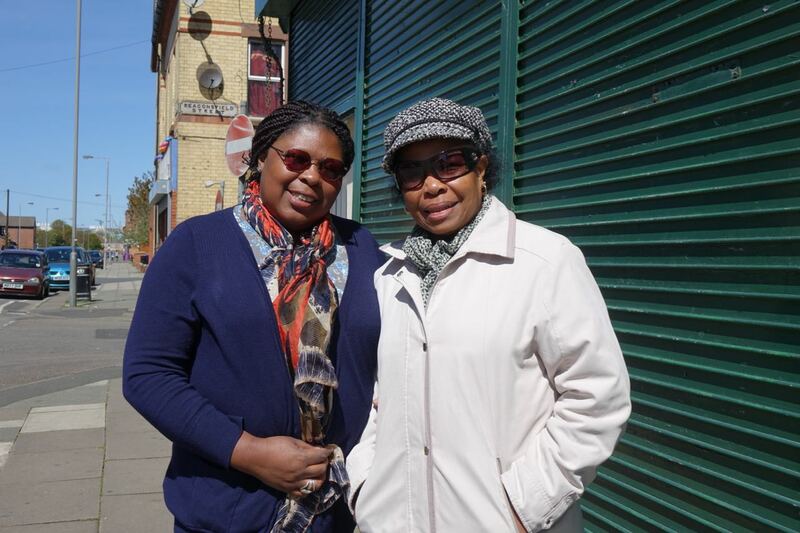 Daphne’s always lived in Granby and Yvonne grew up here. But the reason Yvonne knows my name and, as it turns out, a good deal about me is she’s a regular reader of this blog! 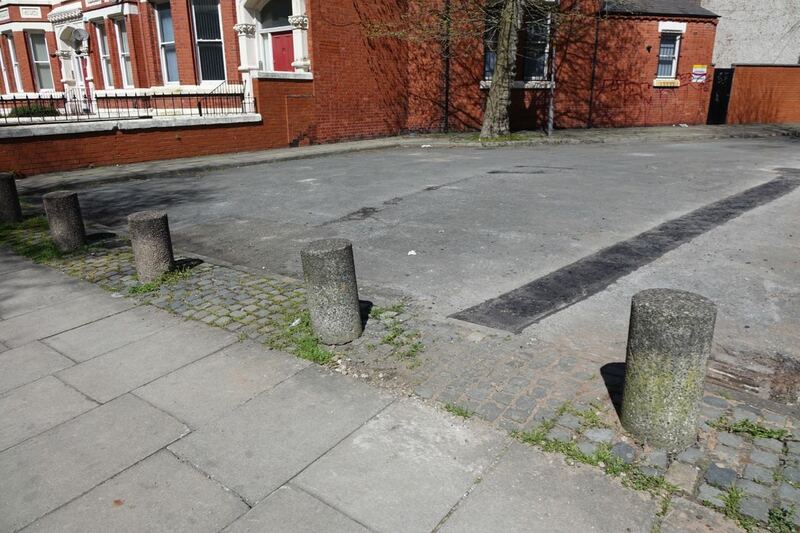 So we talk bollards and their delight at Granby 4 Streets and I take this picture before we all walk on. Lovely to meet both of you. 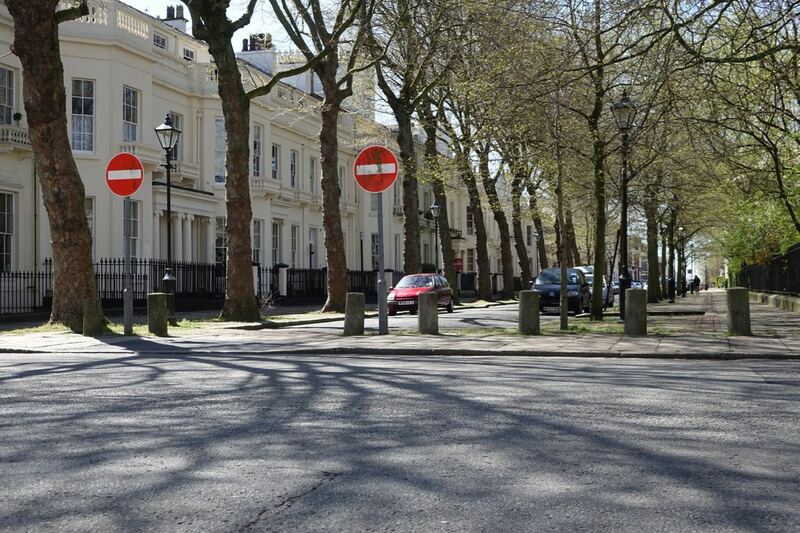 More of those red light bollards, at the Princes end of Cairns Street. And the Beaconsfield ones we saw just before abandoning yesterday’s rainy walk. 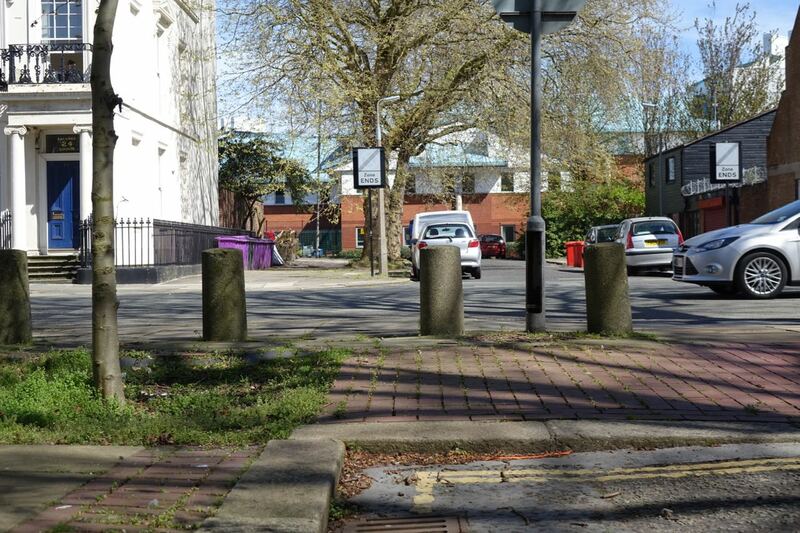 But although I mainly concentrate on the 4 original streets end of Granby, today, in the interests of our Bollard-quest, we’re going to walk through the very altered rest of it. Between here and Upper Parlaiment Street. 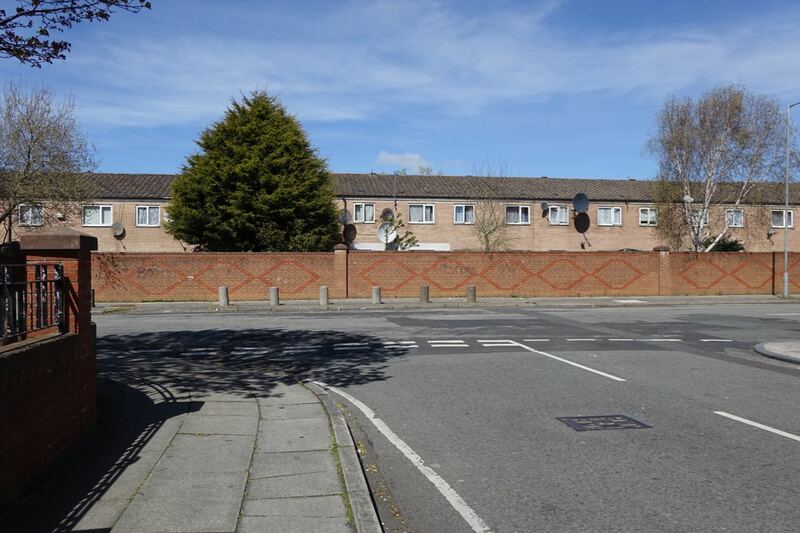 Here’s Arundel Street, or ‘Arundel Close’ as it’s now called. A bit of the early 70s street scaping preserved. 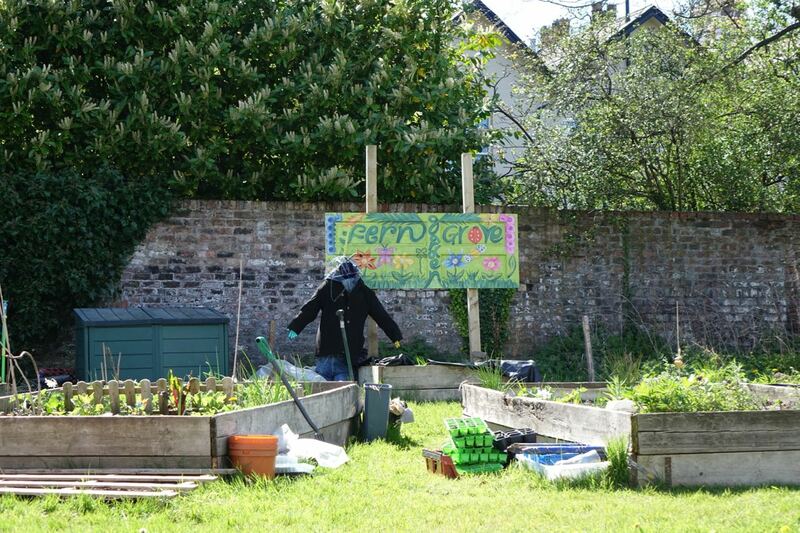 See the benches and the pleasant raised planting beds as envisaged? No, me neither. Remember, it was going to look something like this? Well, time for a new, new start. Plus Dane getting on well with these Beaconsfield Street houses. 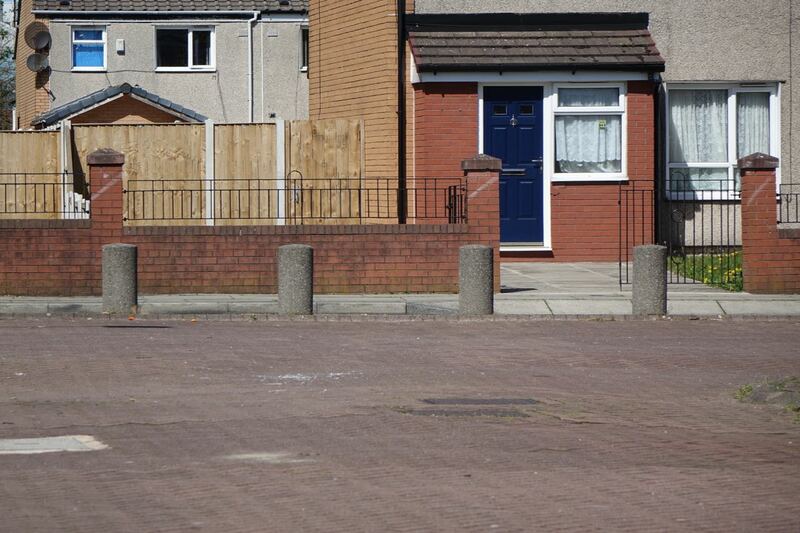 The rest of Granby divided into small, mostly cul de sac estates, with bollards. 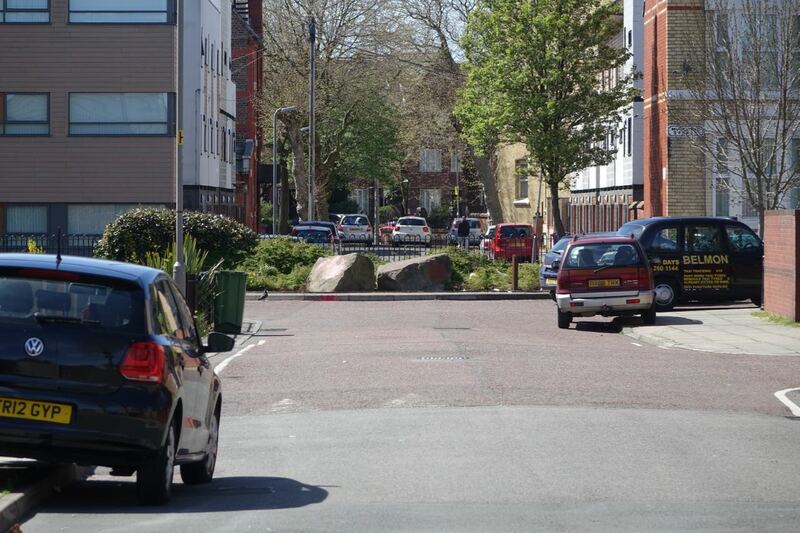 Even bollards and big rocks. 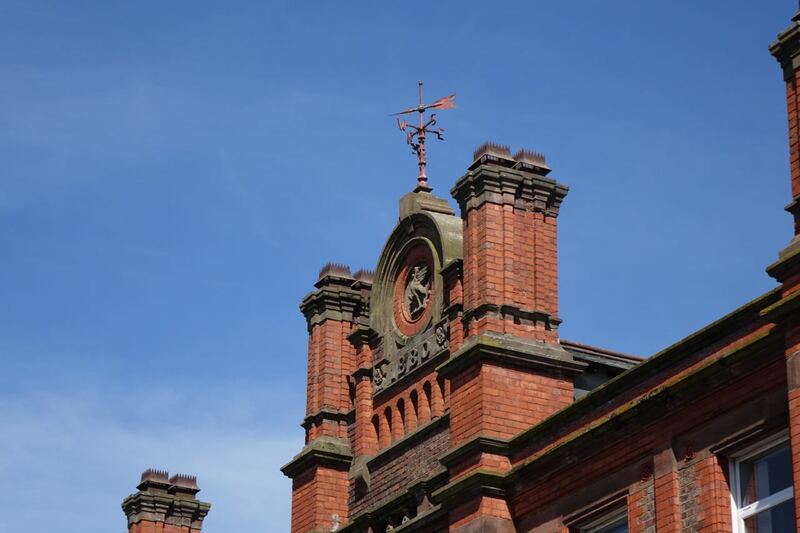 A survivng piece of old Granby Street, the school house. Opposite what the 1970s brought. Replacing the original Granby streets that stood along here. 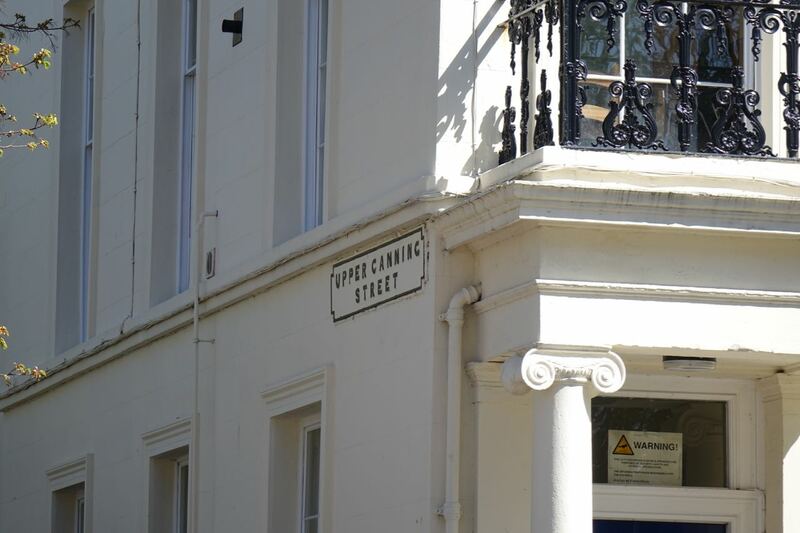 And on the end corner of Granby Street? Well this didn’t used to be the end corner. 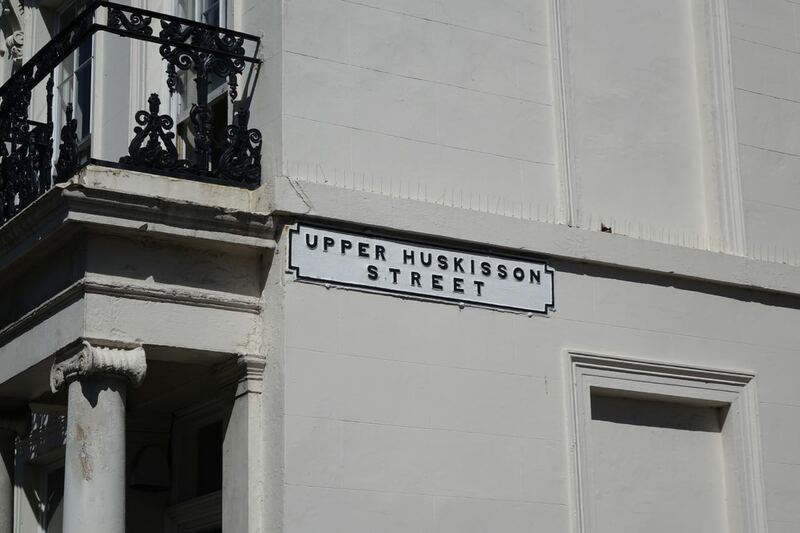 Granby Street used to flow through to Upper Parliament. And now, marking where this used to happen? 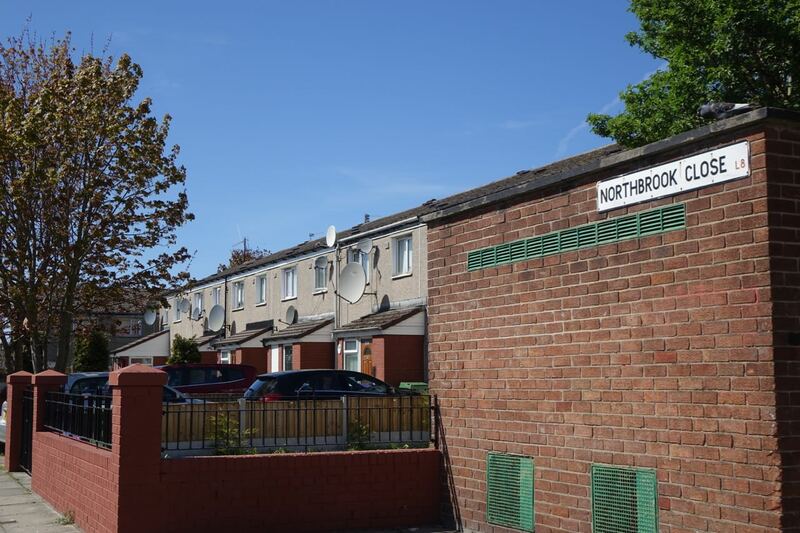 A blank walled 1970s estate. So these are nothing to do with the 1981 riots. 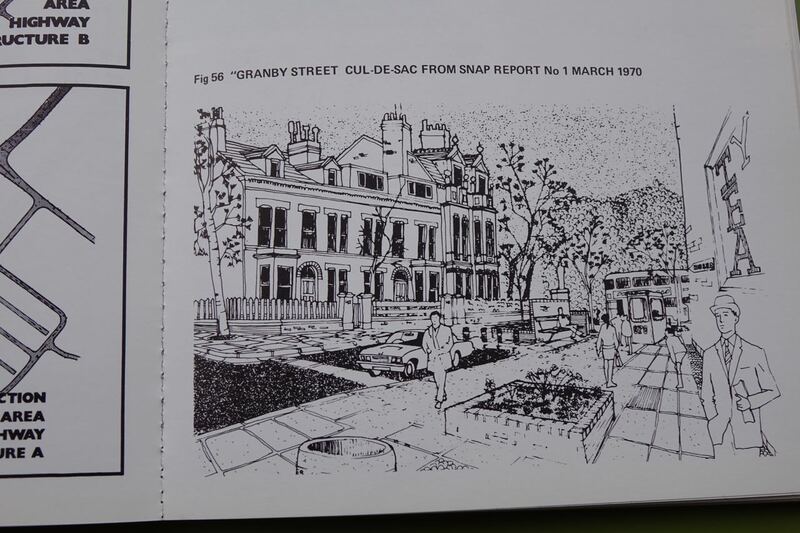 This estate had already cut Granby off from Upper Parliament by then. 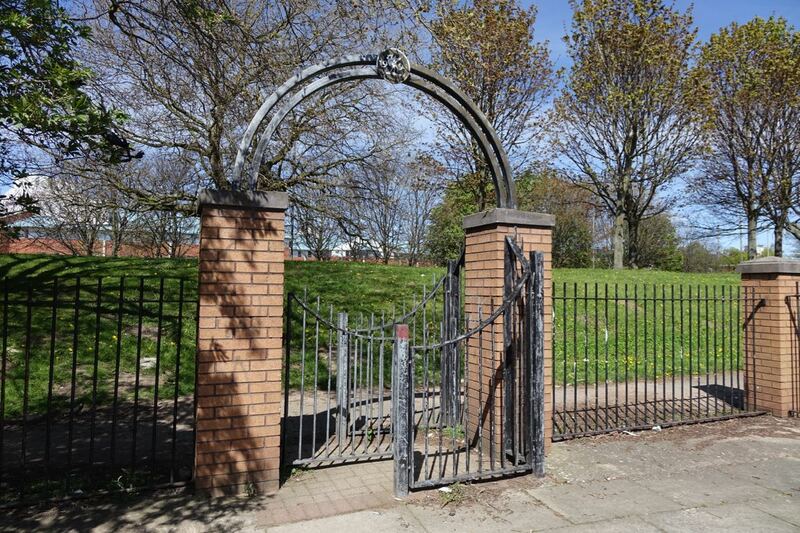 But we’re about to see a landscaping feature that is to do with those riots. 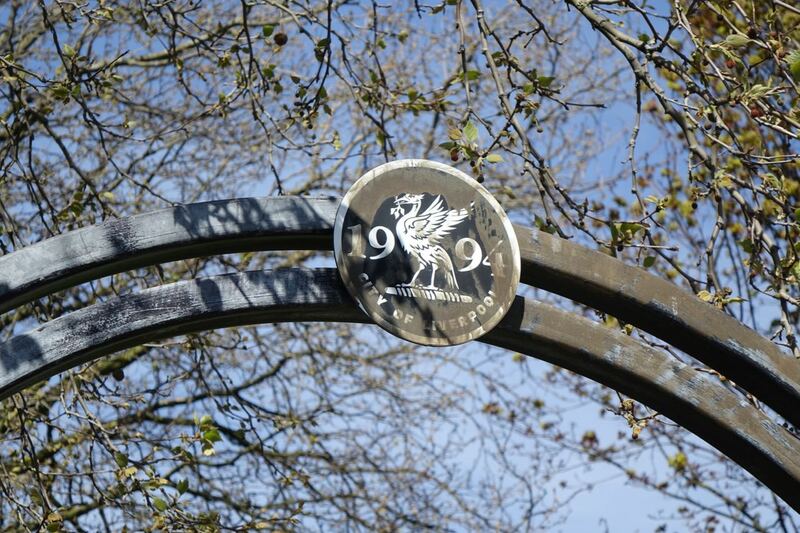 Which were added in 1994. Introducing the Riot Hills of Upper Parliament. Not a natural feature then? Certainly not. In 1981 both sides of Upper Parlaiment had wide borders of flat land. 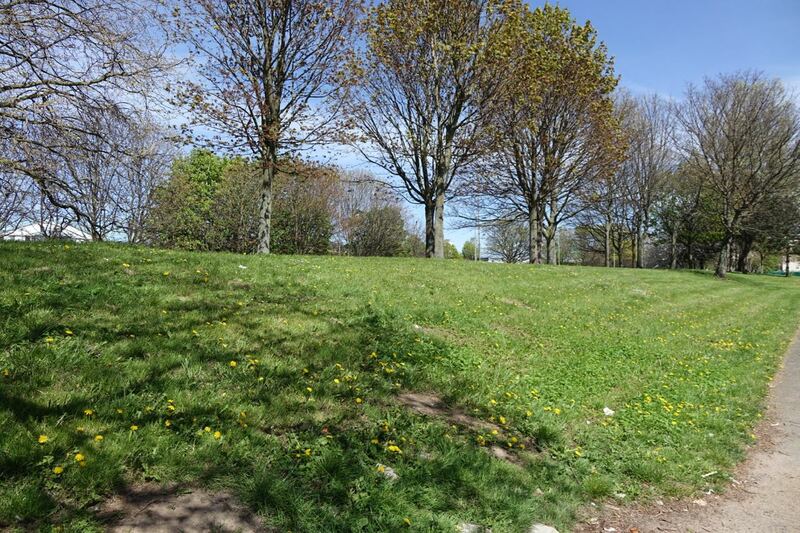 Land left behind by the clearances that had been done in the 60s and 70s. At first so Upper Parliament could be part of the M62’s entrance into Liverpool. 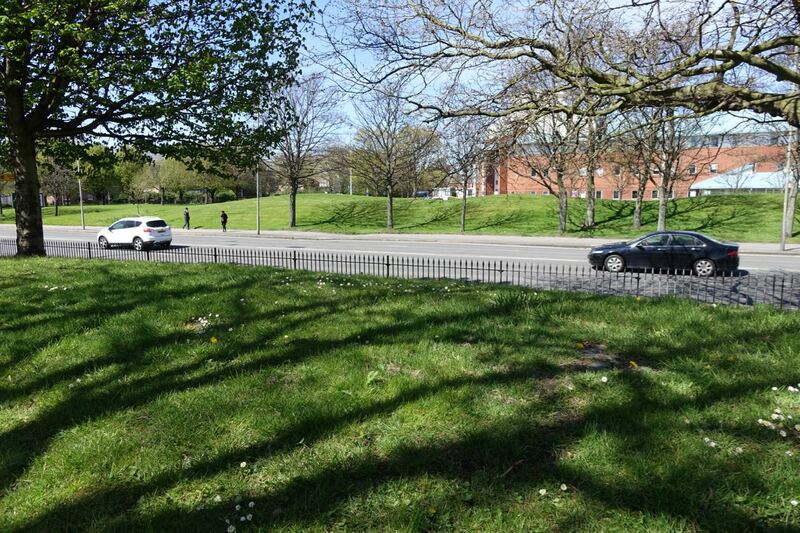 Then when that didn’t happen, when it was to be part of a planned inner ring road. 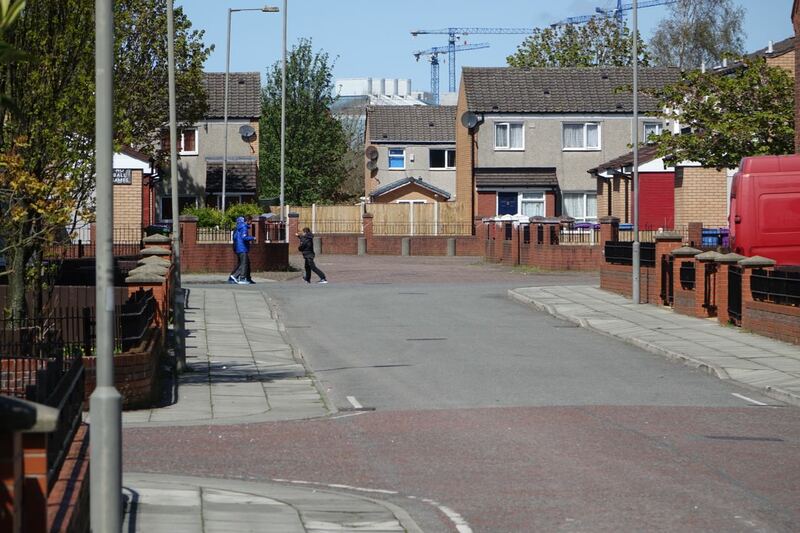 During the ’81 riots this flat land was a major gathering place. 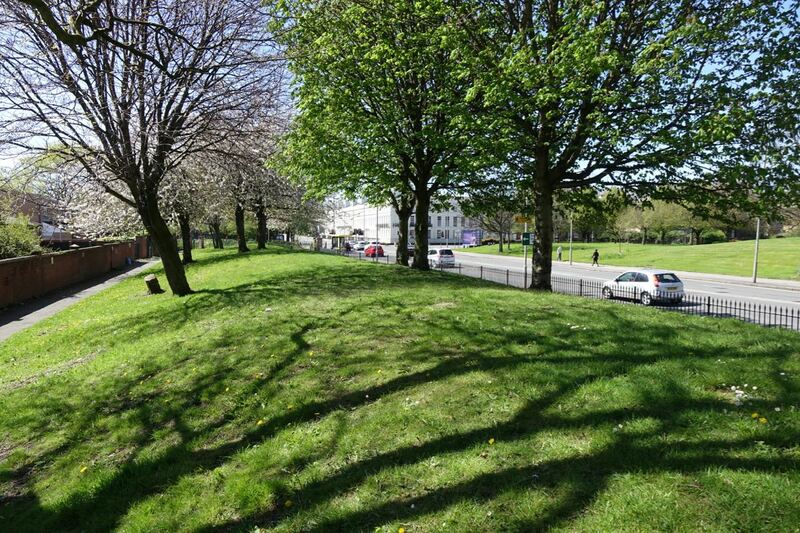 And so in subsequent years these hills were built, on both sides of Upper Parliament. To stop any more riotous gathering. Even behind a fence on this side of the road. 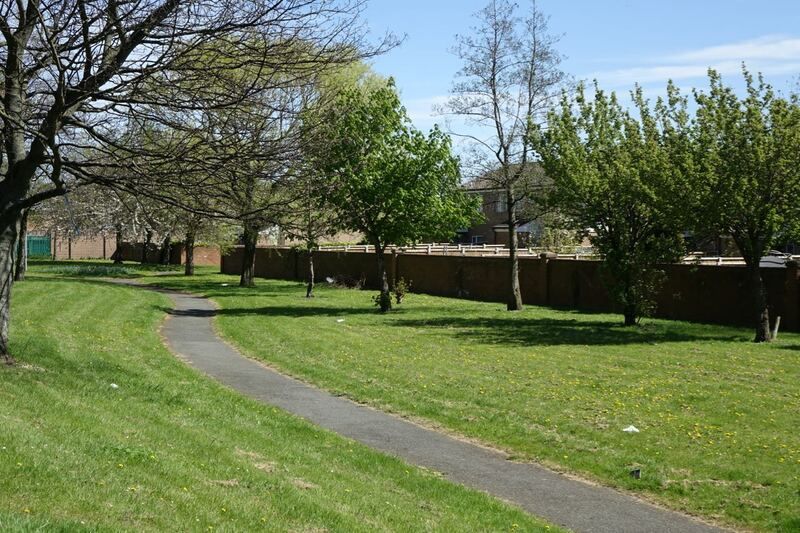 And used now by the residents of Granby as a pleasant piece of parkland? I’ve never seen them. It’s a pretty steep hill. And from the top of it look what you can see? 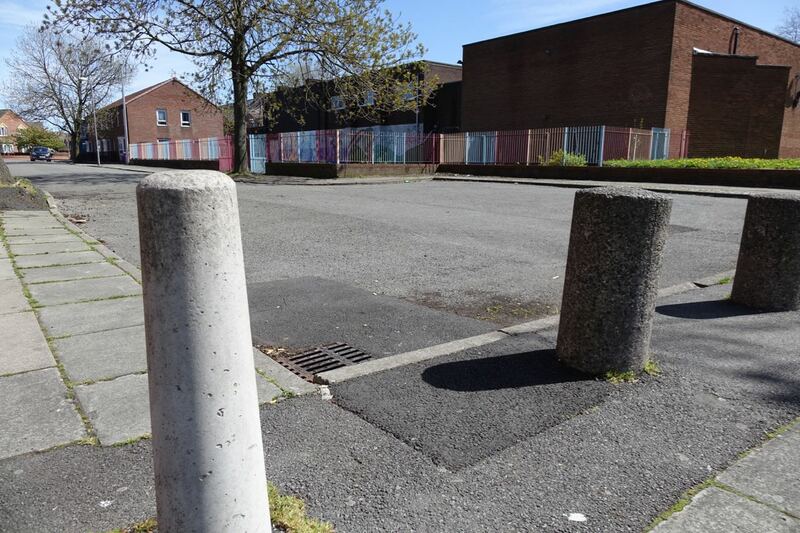 Yes, very special and decorous bollards indeed. 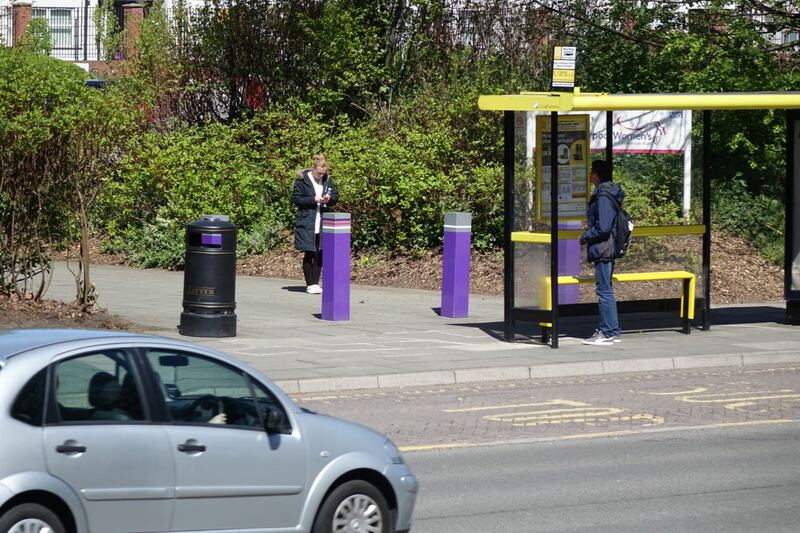 These are the ones that stop you crashing your car through that bus shelter and ramming your way into the Women’s Hospital. Let’s cross over and have a look. 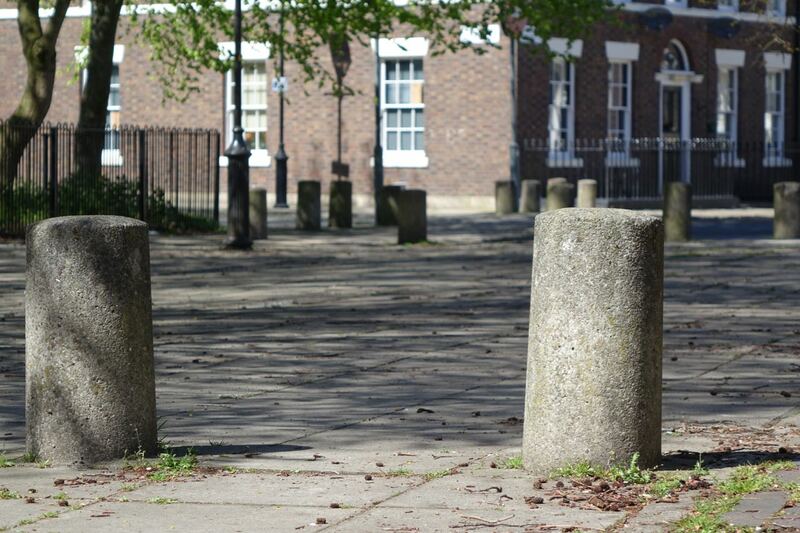 An impressive sight for all true bollard fans. 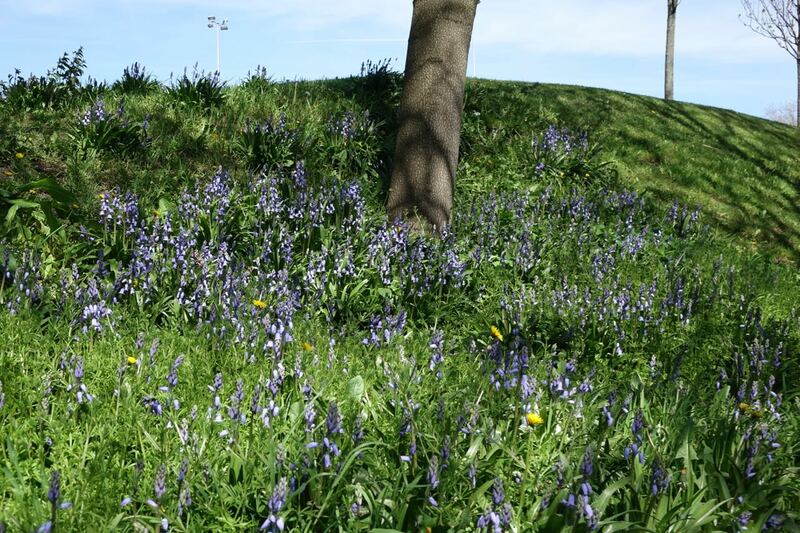 And the Riot Hills over this side are maturely planred now. 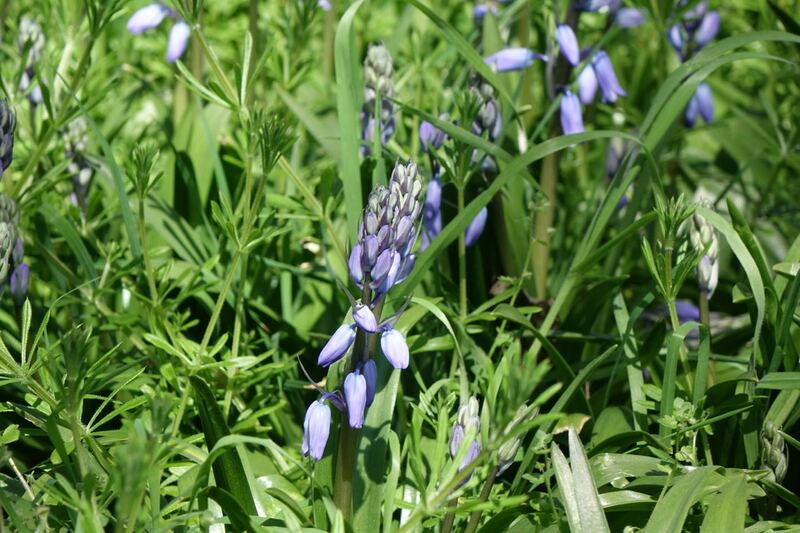 The spring bluebells just coming out. They’re still Riot Hills though. 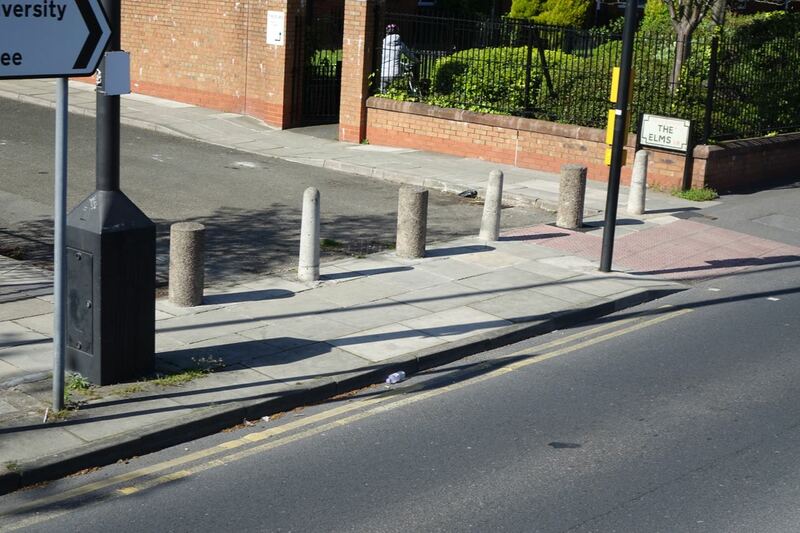 With whole armies of bollards in the gaps between them. 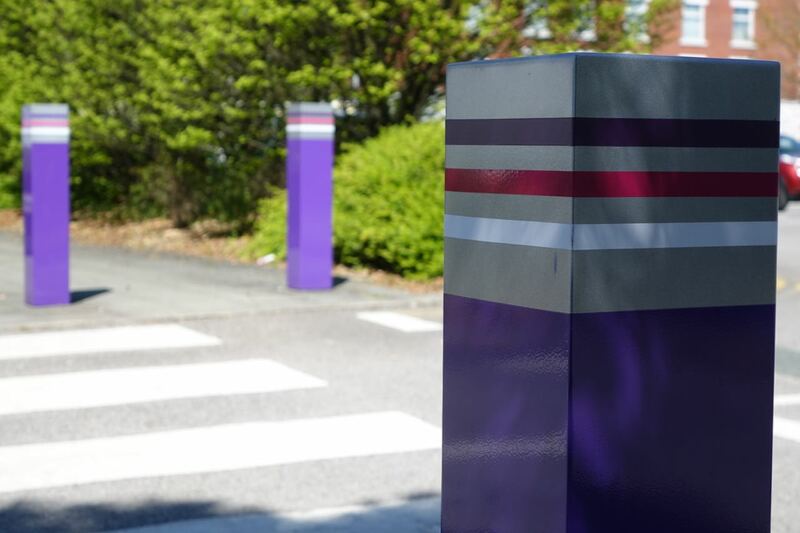 The high point of the bollard maker’s art? Good and welcoming, I don’t think. 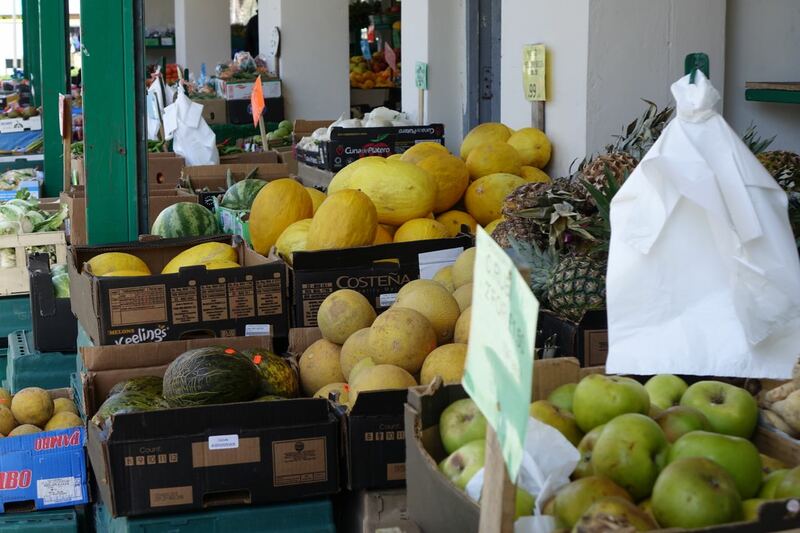 Let’s go round the corner into Canning. 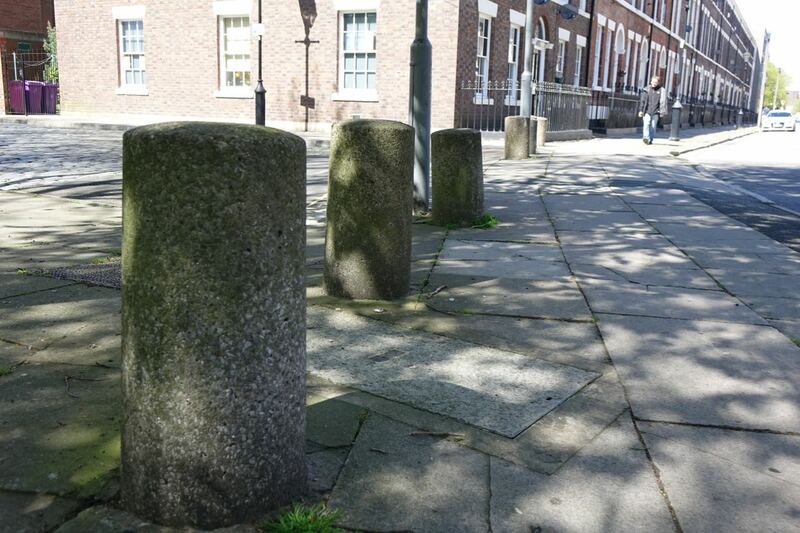 Immediately greeted by some purposeless left over from history bollards. 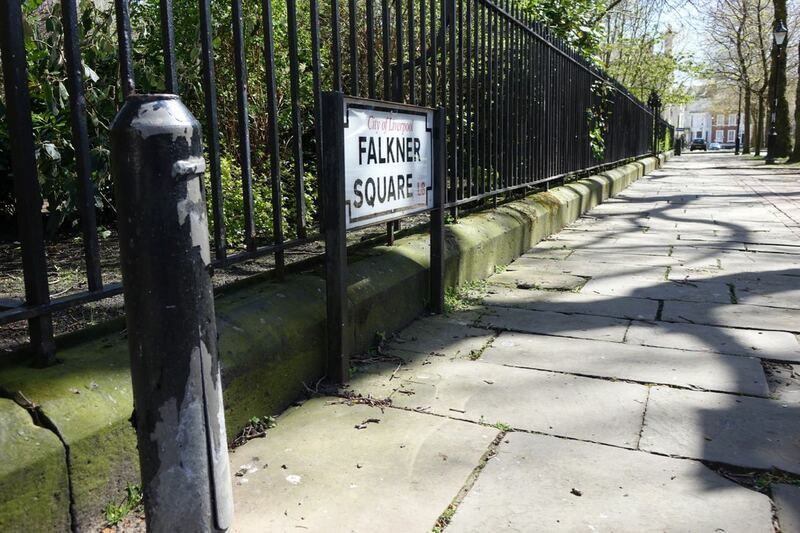 Then we get to Falkner Square. 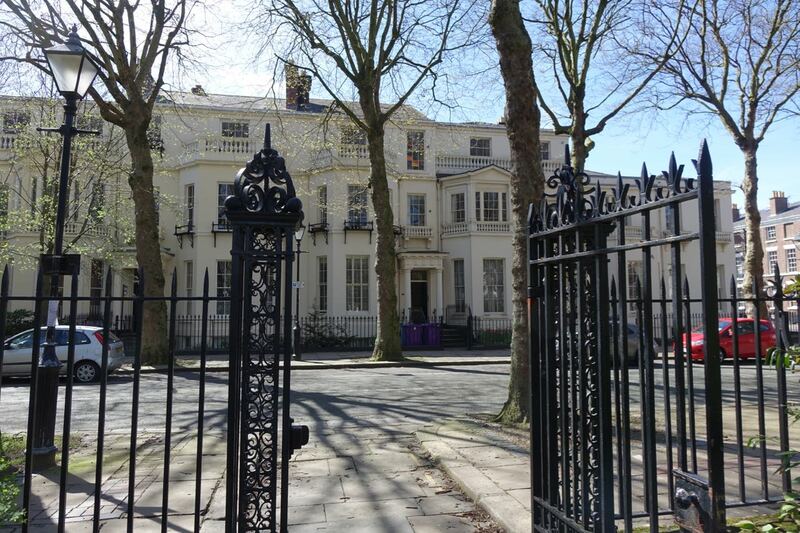 Now in anybody’s ‘Big Book of Liverpool’ Falkner Square has to feature as a place of astounding beauty and also great significance. 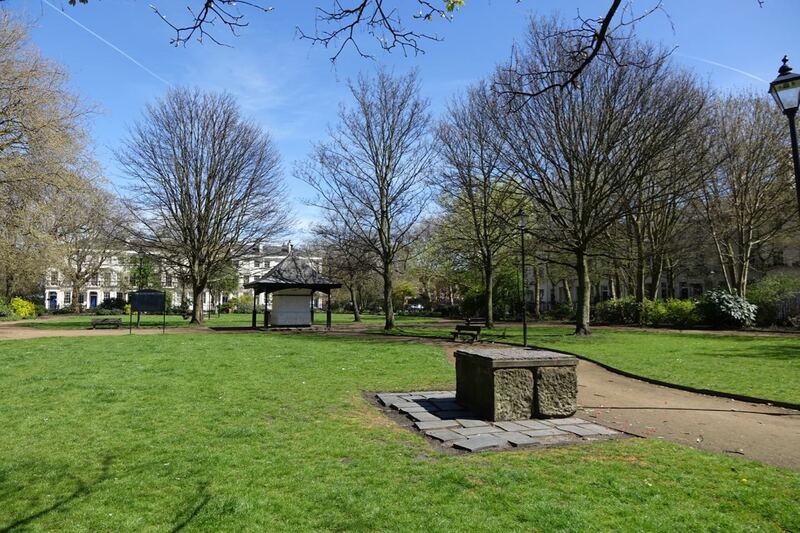 It is a complete Georgian Square. The only one we have and in the opinion of many, including me, the very finest complete square of Georgian buildings on Earth. So why is one side of it blocked off? Well it’s the old red light problem from the 1970s. 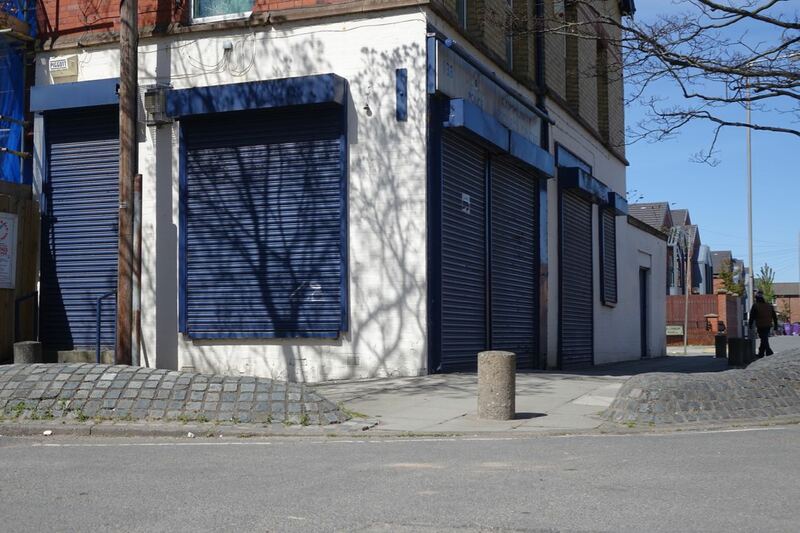 When kerb-crawling was run out of Granby it crawled over to here. 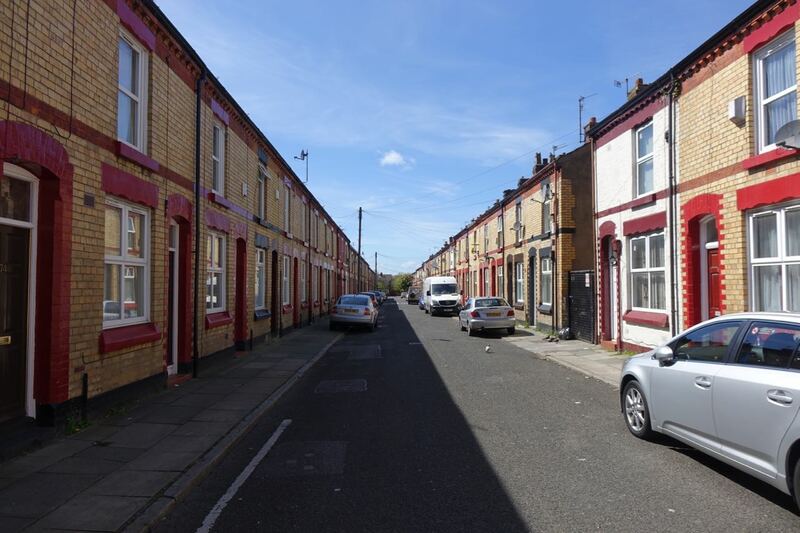 So when I started working here for Liverpool Housing Trust in 1975 this was a tough place, down on its luck and full of predatorial men looking to pick up prostitutes in their crawling cars. So like Granby before it, it was bollarded. 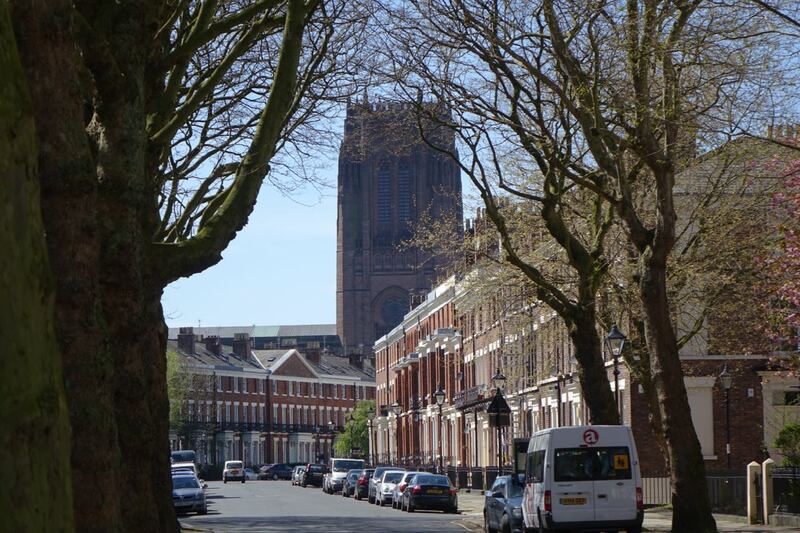 Looking out now from Falkner Square, to where Upper Huskisson Street still stood until the early 70s. A tiny stump of it still does. 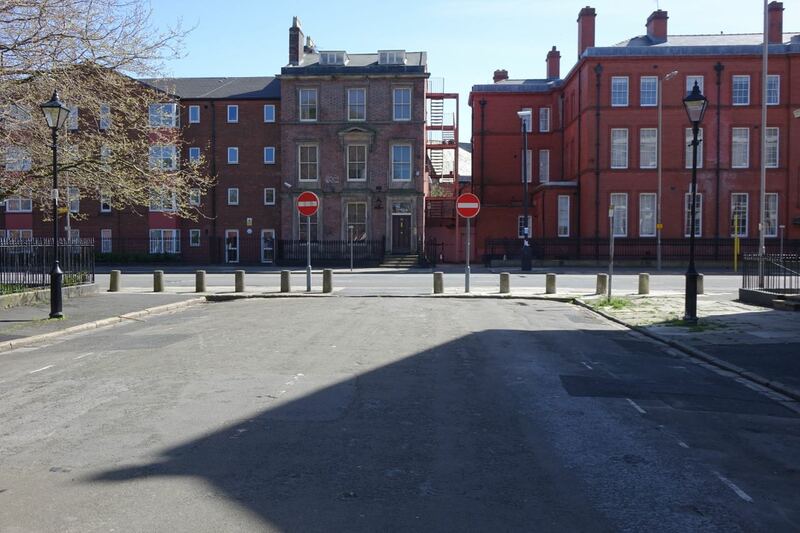 Upper Canning Street too, now just bollards. 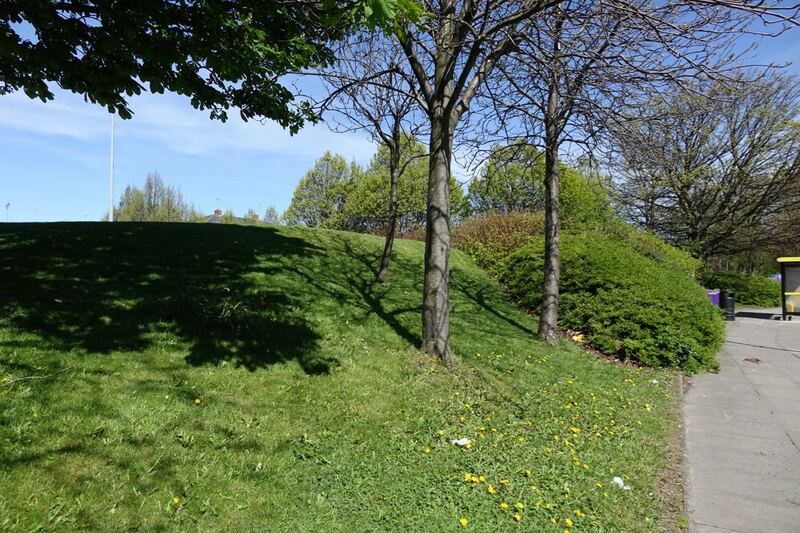 All demolished for the motorway and the ring road that never came. And eventually replaced by the Women’s Hospital. Next, approaching another edge of Liverpool 8 where it shades into Liverpool 7 and University land what do you expect we’ll find? 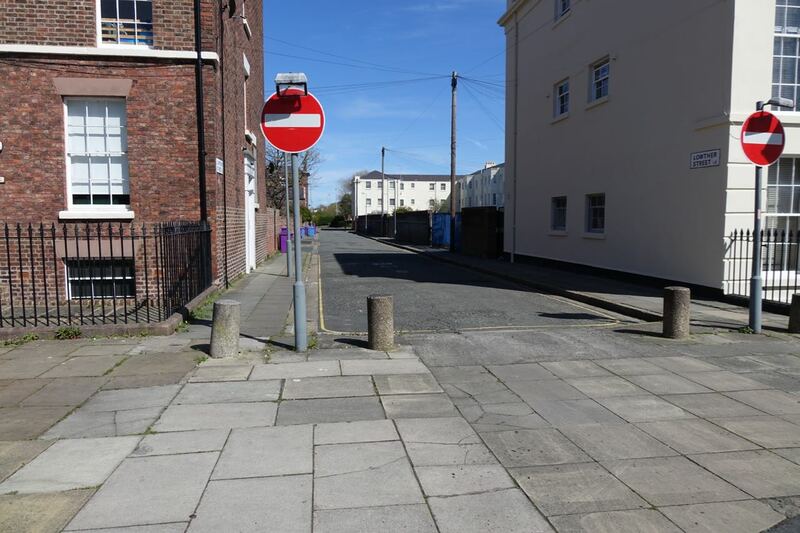 Blocking off Sandon Street and Back Falkner Street. For absolutely no reason I can fathom. 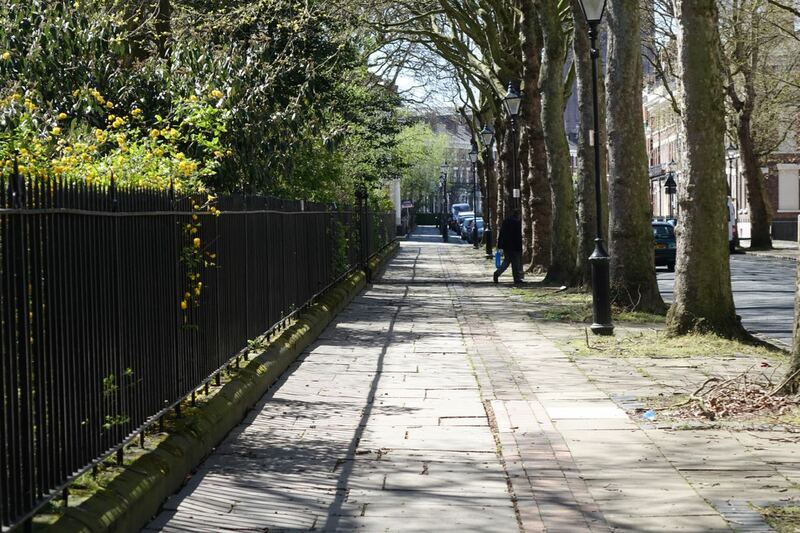 I walk along the Canning Street side of Falkner Square. 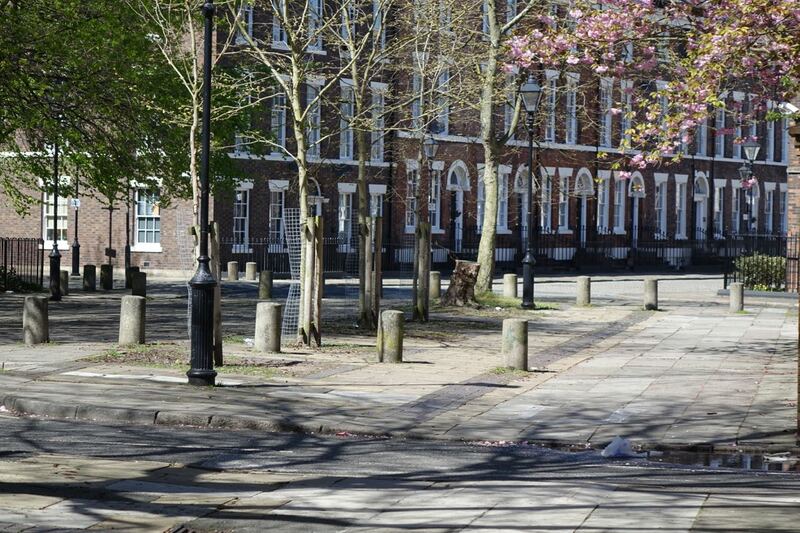 And into the lovely square itself. Where a happy hour is spent, peacefully reading. 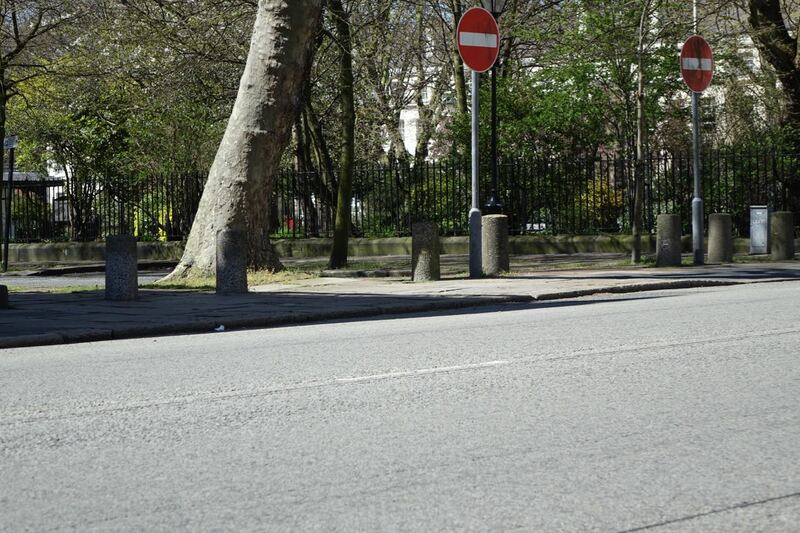 Finding that even the street sign has its own protective bollard. They lurk in the quitest and grandest of corners. 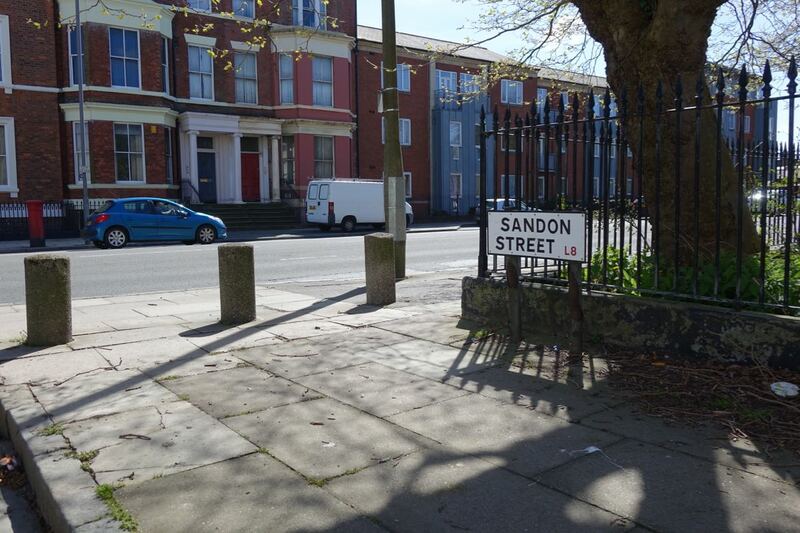 And of course divide Sandon Street from Upper Parly. As they’ve bravely been doing for 40 years now. 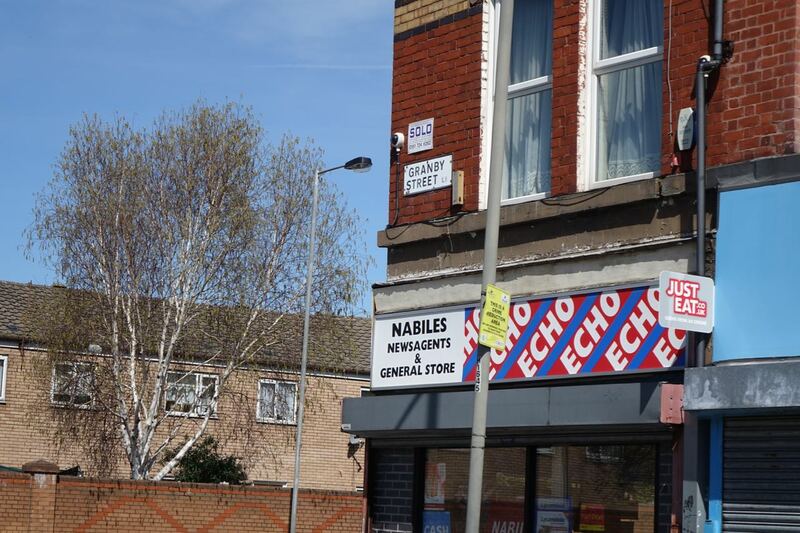 Which brings us pretty much back to the Rialto along there, where our bollard quest started yesterday. 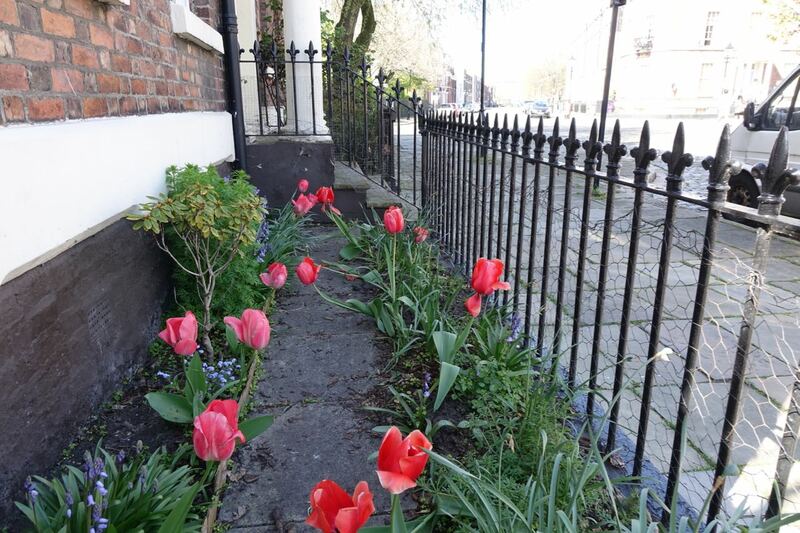 So pausing only to admire these giant tulips in Bedford Street South, I walk down the hill to the 82. I think you’ll have been expecting this answer by now. 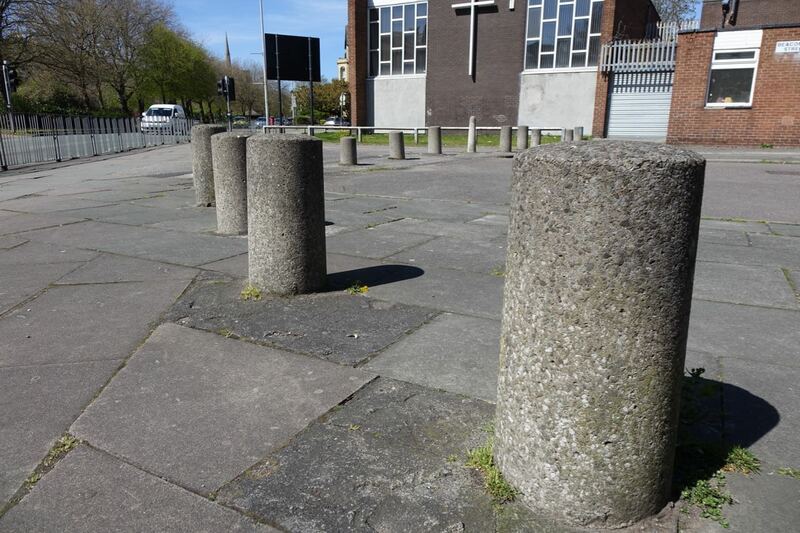 So check here for Part One of ‘The Bollards of Liverpool 8’ – the Dingle and Welsh Streets companion to this. A privilege to join the avant-garde, I think! 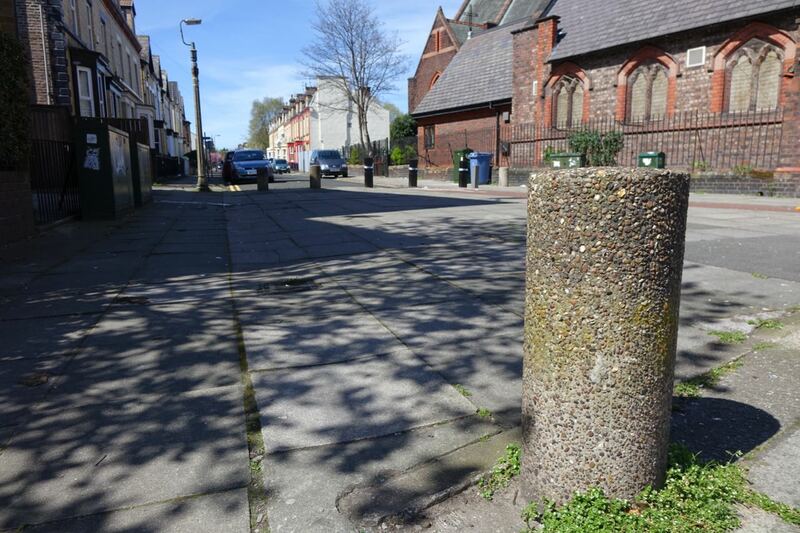 yeah ok, im the first to admit that the bollards arent exactly the finest feature in the liverpool 8/toxteth area but if you’re originally from the area you must remember the need for them way back when?i was born in asbridge street and grew up in wordsworth and i remember very clearly having to run out of the road outside my home(which was in the middle of a residential street)when i was a kid to avoid being hit by one of many,many stolen cars which were driven around the toxteth area day and night.many of the streets you have taken pictures of are the very streets which were used as escape routes by the car thieves.all through the ninties parents all over toxteth were scared to let kids play in the street due to the number of cars speeding around,as ive already said many stolen,and whats changed today?well at least the cars arent stolen anymore!instead idiots ride around on scramblers and quads with no license or insurance or even any idea how to control the massive peice of metal they are smashing down the road on.and ok the plans for parliment street changed before the road was improved….so?doesnt this happen all over the country in all types of areas? 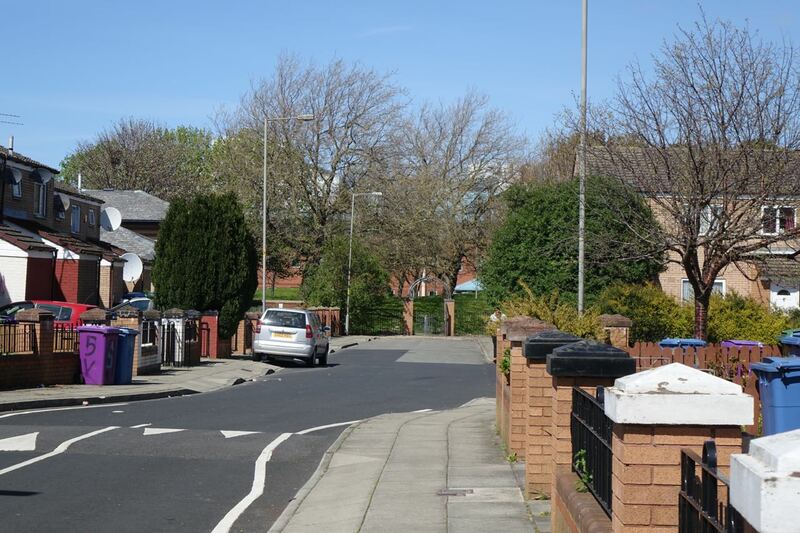 (yes i know posh or more affluent areas dont have this but then money solves a lot of problems)local authorities deciding to go another way at the last second?”riot hills”?ok if my house is broken into due to a weakness in the properties security am i wrong to fix that so it doesnt happen again?so why act like the council/powers that be are acting just against this area?lets remember that were not talking about the rights and wrongs of the riots and its causes,were talking about how the area was rebuilt after…erm….WE destroyed it!you break something thats not yours you dont get to complain about how its repaired.the area has some serious problems and has had some of them for decades,but is getting rid of bollards that in some cases are still of use,going to solve any of those problems? 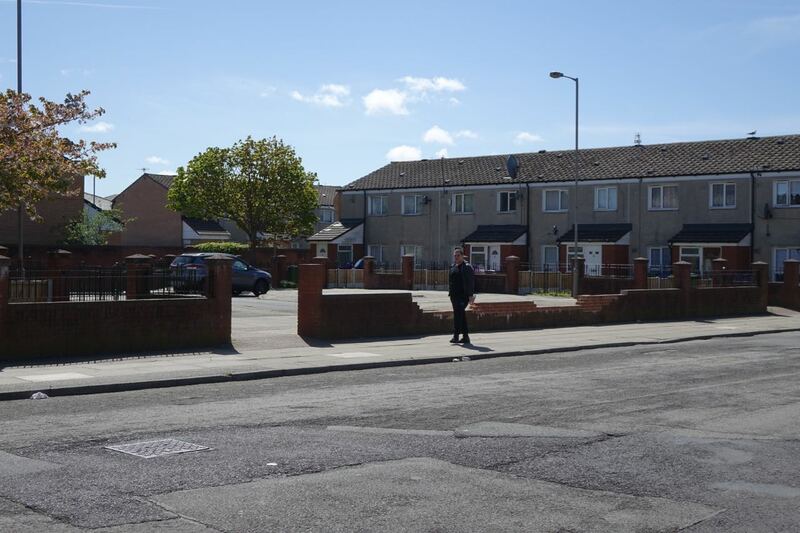 il be honest,this is a debate that could carry on for days,but i just got the feeling that you were condeming the area for its collection of bollards when there are much more important issues that need to be looked at. 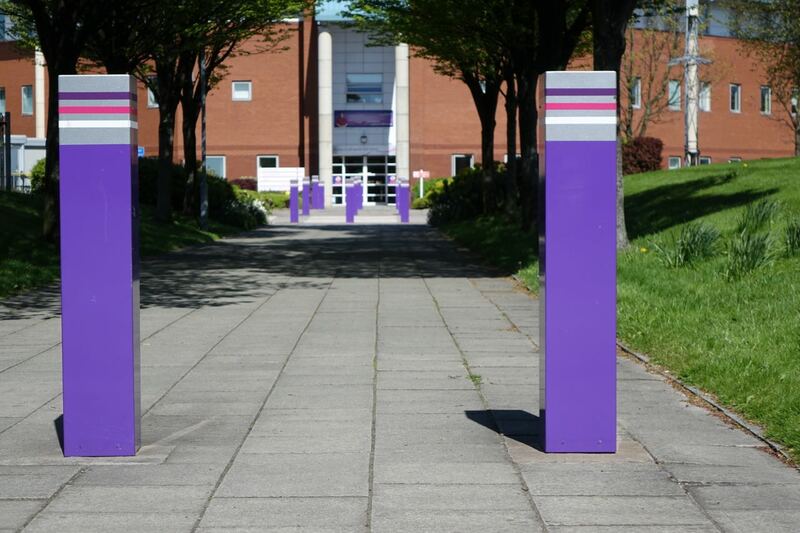 Nice talking to you today I’m seeing bollards everywhere I go. So am I after 2 days of it! Good to see you and your mum and such a surprise to hear you calling my name there! Thank you Jan, the blue sky was a compensation for the camera being rained on the previous day!